There’s nothing more popular with kids right now than slime. 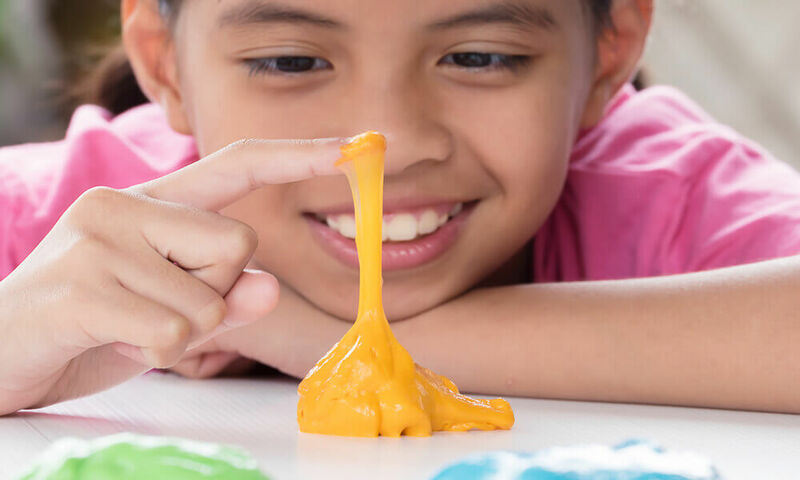 Whether it’s fluffy slime, sparkly slime, edible slime or green slime, kids are crazy about this gooey goodness. It’s squishy and stretchy nature is utterly satisfying and keeps the kids occupied for hours on end. They make strange and unique creatures with them or just play with the concoction. And do you know what’s surprising about slime, or glurch, flubber, gak and gluep it’s also known as? That it’s made of glue, water and a couple of other ingredients, which are readily available. So instead of wasting money on store-bought slime, how about making it at home itself? We, at ScribbleFun, will tell you the exact DIY slime recipes to make at home. And we won’t be covering just basic homemade slime recipe, but also slime without borax, glitter slime, fluffy slime and more. So without wasting any more time, learn how to make slime below. Making a slime is no less than an experiment. You can reduce or increase the quantity of the ingredients, depending on the amount of slime you want to make. But do you know what’s the science behind slime? We’ll tell you! Starch or borax powder contains borate ions, which forms into the stretchy substance when it’s mixed with PVA (polyvinyl-acetate). This method is called cross-linking. Secondly, glue, which is basically a polymer is made of identical, long and repeating molecules or strands, which flow past one another, keeping it in a liquid state. So when you add borate ions to glue or PVA (polyvinyl acetate), it starts connecting these strands together. They tangle and mix until the substance turns thicker, stretchy and rubberier. Did you know? As per CNBC, the idea of making slime with glue is so widespread that parents keep their house stocked with glue to make slime as and when needed. 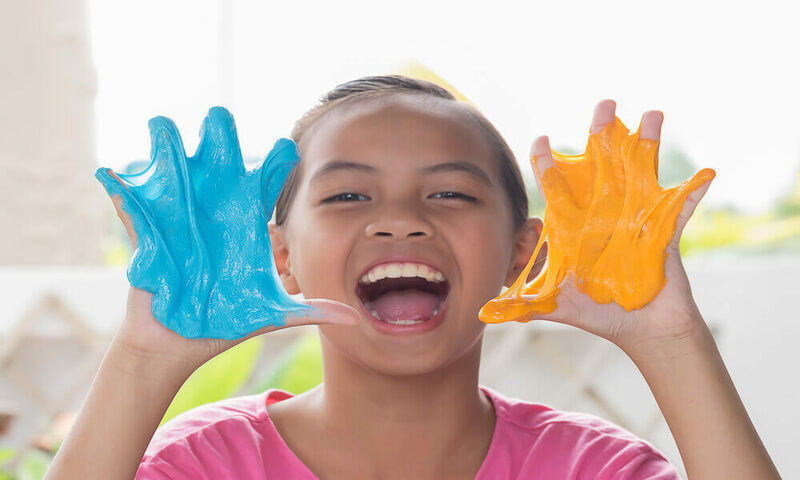 So if you are wondering how to make slime with glue, we are here to help you with our slime with glue recipe. Before proceeding, we’d like to tell you that the recipe requires 4 ounces of warm water and glue each, but the measurement doesn’t have to be exact. A little bit here and there would be fine. Squeeze 4 ounces of glue into a glass bowl and add warm water to it. Add your desired color food coloring and mix again. Now add one teaspoon of borax into ½ cup of water, mix and add the solution to the glue mixture. You will notice the slime coming together. You don’t even have to add all of the borax solution. Add slowly and when the mixture starts attaining the desired consistency, stop adding more. Now begin with the kneading. At first, the mixture will be gooey and wet, and then sloppy and stringy, but it will finally hold together. Just keep kneading until you get a mass that can be molded, shaped and pulled apart. Parents are often concerned about the presence of borax in the slimes, which has the potential to irritate the skin. Therefore, we are including a borax free slime recipe, which you can make at home. Pour 6 ounces of glue in the bowl and add a pinch of baking soda to it. Add the contact lens solution to this mixture and knead until you get a slime like consistency. Please keep in mind that you need to add small amounts of contact lens solution in the mixture. Do not add all of it at once. Your slime is ready! More than anything else, children love to play with fluffy slime. So here’s a recipe for the same for you. Pour the bottle of blue into the bowl and add three ounces of shaving cream to it. Next, add the contact lens solution to it and mix until you get the desired, fluffy consistency. When you squish it with hands, the slime will pop bubbles. So make sure your slime also makes these sounds. Knead a bit more, and your fluffy slime is ready. If you want to make slime with ingredients lying in your house, this recipe could come handy. Its core ingredient is body wash, which is found in almost every house. Read on to know how to make slime with body wash.
Add body wash to a mixing bowl, starting with two tablespoons. You can add more later to increase the quantity. Next, add food coloring and mix until you get the desired color and the consistency is smooth. Now you need to pour cornstarch into the mixture. The amount of cornstarch should be same as the body wash. Mix the ingredients with a spoon or whisk and then knead with hands. Initially, the mixture may seem a bit floury, as if you have added too much cornstarch. But everything will turn out fine once you knead it well. If you want to make your slime a bit stretchy, add water to it, until you get the desired consistency. 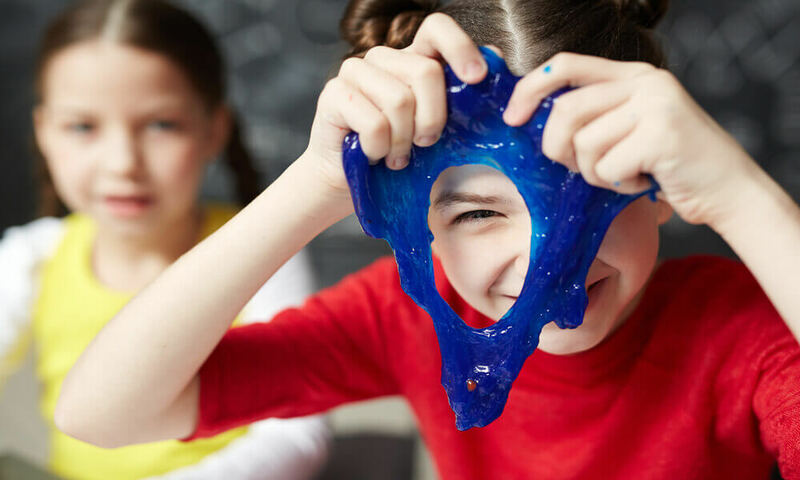 As surprising as it may sound, but you can even make slime without glue and borax. Don’t rub your eyes in amazement. It’s actually true and requires ingredients that can be in your home itself. Pour the shampoo into a mixing bowl, starting with just two tablespoons. Feel free to add more later to make a larger batch. Next, add shaving cream to the bowl. Please remember, the ratio of shaving cream and shampoo should be 1:1. Mix both the ingredients well, until it acquires a uniform consistency. Next, you need to add salt. The amount of salt you add should be ¼ of the amount of shaving cream and shampoo. For instance, if you are adding two tablespoons of shampoo and shaving cream each, then you must add one teaspoon of salt. Mix until it acquires a smooth consistency. Next, freeze the mixture for 15 minutes and then take it out and play. You must have seen clear slimes in horror movies. They look sticky, gross and are generally green in color to intensify its grossness. We’ll teach you how you can make clear slime in the home itself. Before proceeding, we’d like to inform you that this slime involves a couple of chemicals, but they are not proven to be dangerous for children. How To Make Clear Slime? Measure and add 2 ounces of PVA in a plastic cup and add 1 ounce of the Borax to it. Stir for several minutes, until the PVA sticks and clumps together on the spoon or stirring stick. This will give you your slime. You can increase and reduce the ingredients according to the amount you need. If you want to make things a bit more fun, add the food coloring of your choice to it. We’d suggest you add green or blue food coloring to it. You can store the slime in a zip-lock bag for up to 2 weeks or even more, until it doesn’t emit a funny smell. We don’t know about you, but we totally love glitter slimes. They are a lot more appealing and are fun to make. So give your slime some twinkle by following this recipe. And don’t you worry, this recipe does not involve borax. How To Make Glitter Slime? Add ½ cup water to the mixing bowl, and add ½ cup glitter glue to it. Please remember that the water and glue ratio should be about 1:1. Now add the liquid starch to the mixture. The amount of liquid starch should also be the same as glue and water. Now mix all the ingredients with a stirrer or smooth and your glamorous glitter slime is ready. Most of us want our slimes to be stretchy without being rubbery or sticky. But sometimes, things might go wrong, and you may end up with a strange looking, unusable slime. But you don’t need to fret. Very rarely have people got the perfect slime on the very first try. Practice will make it perfect. And even we will help you a bit. If you slime feels a bit too sticky for your likening, place it back in the mixing bowl, add some water and squish. If the consistency is still the same, add another ½ teaspoon to the water and put the slime mixture back into the bowl. Squish and knead, and the slime won’t feel sticky again. If your homemade slime feels a bit too stretchy, mix ¼ teaspoon borax in water and stir until dissolved. Now put the slime into this mixture and knead again. Your slime won’t feel stretchy. Slime often feels rubbery when it’s fresh, but gets fine when it’s warmed up by playing. But if it still feels rubbery, then we have a solution for that as well. Make a super stretchy slime and combine it with the rubbery slime and knead until you get the desired consistency. For making a super stretchy slime, add extra ¼ teaspoon borax to the standard slime mixture or extra glue if you are making glue slime. Now, this is a real issue! Children often come to parents with slime stuck in hair or clothes. To remove it, apply vinegar to the area the slime has attached. The vinegar will dissolve immediately. Making slime at home is no less than a chemistry experiment, and like any other science experiment, it must be done with adult supervision. Ensure that the adult of the family handles and measure the chemicals required for making slime. After you have made slime, ensure that the area is cleaned up properly. You must sterilize and disinfect the containers and mixing tools after you have made slime. And never throw slimes away or put down the flush or drain. It can block pipes. You must also wash your hands thoroughly after playing with slime. Never substitute the ingredients mentioned in the recipes. Neither can you add or subtract the ingredients. The only thing you can do is increase or reduce the amount of ingredients. So why wait? Pick up these ingredients from your nearby grocery store and start making slime at your house right away. All these homemade DIY slime recipes are great and would make a great activity to do with kids. You can ask your child what kind of slime they prefer and make it with them. They’ll surely enjoy mixing and squishing the same. And when you and your child are done playing with it, store it in a sealable container or a ziplock bag. It will stay fresh for over two weeks. We would love to hear about your experience of making slime at home with kids. So let us know by commenting below. And don’t forget to check our our New Year coloring pages.